I have become a mother 3 times since 2009 and each time was different. Each pregnancy was different, each birth was different and each baby was different. So was my level of readiness and support. I definitely knew more about parenthood with number 3 than with number 1, but I learned new things each time. I always wondered why none of these things are discussed during pregnancy. I love all of my children and cherish the memories of their births and their newborn days, but there are definite challenges during pregnancy and during the postpartum period that I learned from. I learned about my abilities and the strengths and weaknesses of myself. When I was mom to my biggest, I had time for just her. No other children distracting me. I was also so unprepared for how demanding breastfeeding a newborn is. The breastfeeding class I took really didn't do a good job of conveying how much work breastfeeding would be. They had me believing that breastfeeding would come naturally and that I would lay in bed all day lovingly looking into my baby's eyes. ​I also thought I knew it all because I started caring for other people's children at a young age, and had worked full time as a nanny for about a decade. Then I became pregnant with my middle. I thought I knew it all. Biggest was 3 and I figured it would be easier. Well middle was a much more difficult birth and pregnancy and I was dealing with mourning the loss of my one on one time with my biggest. I had a planned homebirth for #2 and great support, but figured I could do most things myself. Well, thank goodness I encapsulated my placenta. My hormones were out of balance without my pills, and they gave me enough energy for both kids. With my littlest (#3) I was worried about not having enough time to pay attention to all three of them and worried that my then 2 year old would be jealous and would be difficult. My pregnancy and birth with #3 were easier and I have to say was probably my easiest baby, even though I nursed through pregnancy, and tandem breastfed. It was probably a combination of experience, support, information and placenta pills. Becoming a mom or parent is not easy. There are so many transitions and things to learn, but with the right support and education in advance and during-you can do it with ease! I offer classes privately and over Zoom for Postpartum Readiness, and Beastfeeding. I also support families after their babies are born! Check out my class descriptions and don't hesitate to reach out to book a class. People ask me all the time why someone would want to encapsulate or ingest their placenta. Placentophagy is the practice of consuming the placenta after birth. Many people think it's gross, but so many people are seeing the benefits and doing it again and again in future births. The placenta is a temporary organ that attaches to the uterine wall and grows with the baby. It is connected to the baby by the umbilical cord. It has 2 arteries and one vein and gives the baby all of its nutrients during gestation. The waste from the baby goes back through the umbilical cord and through the mother to dispose of. This makes the placenta a fascillitator organ, not a filter. It doesn't hold on to much. So most medications and toxins leave the placenta through the mothers body. Once it is born and the cord is cut, many new parents choose to take it home. Some choose to bury it, others choose to consume it. Doctors and nurses are taught that it is biohazardous waste and should be thrown away, but it is yours and you can choose to do what you want with it. Many people who choose to encapsulate are hoping for faster healing (the uterus contracts more quickly), more balanced hormones and moods, enhanced milk supply and less fatigue. None of these benefits are guaranteed, but so many people experience one or more of these effects. Recently, a survey was done on over 400 people asking about their experience with their placenta. The risks are minimal if you are hiring a professional. There are many people out there encapsulating now which is awesome! However, parents need to hire the right person. Anyone can go online and watch a you tube video and figure this out. But without proper knowledge of how to keep clients safe, there can be risks involved. How do you make sure that your reusable equipment is cleaned properly from client to client? Where do you encapsulate? How long have you been encapsulating? Or where did you learn? Don't assume that because your midwife or doula encapsulates, that they were properly trained. Encapsulation is not taught in doula training or in midwifery school. Most people who encapsulate professionally, really want you and your baby to be healthy and well and work hard to follow safe standards. When can a placenta not be encapsulated? There are very few contraindications for placenta encapsulation. The most common reason is if mom and/or baby had a confirmed infection. Having a fever in labor can be a sign of infection, but fever does not always equal infection. Having a low grade fever can be a side effect of an epidural. If she has a high fever and is being treated for infection, it is not advised to encapsulate and ingest her placenta. This doesn't mean that it needs to go to the lab. It belongs to her and she should fight to take it home if she wants to bury it or have another ceremony with it. Often, people are told that the placenta had meconium on it and it is not able to be consumed. This is false. If the person preparing the placenta has proper training, they will know how to prepare the placenta properly to get rid of any potential bacteria. Once a placenta is sent to a pathology lab in the hospital, it is not safe to consume. Don't let it go so quickly! Advocate for yourself or have your support person or partner advocate for you! How Do I know if Placenta Encapsulation is Safe? The best way to know if this service is safe for you, is to hire a professional. A professional is someone that can tell you how they learned, where they process, and how they prevent cross contamination from client to client. Encapsulating in the clients home is NOT always a safer option. Be cautious of people who tell you that it is not legal or not safe for the specialist to encapsulate in their own space. 1. What are the benefits of eating placenta after birth? There is limited scientific research of the benefits of consuming placenta, however, people who choose to do this post birth, are hoping to balance hormones, possibly enhancing their milk supply, increasing energy and wanting to minimize the symptoms of baby blues. People are trying to heal better and get to bond with their babies! No benefits are promised and anyone who tells you that you will have more milk, you won't get Postpartum Depression and You will lose your baby weight-is selling false claims and you should be cautious of their intentions, training and process. 2. Why is placenta encapsulation becoming so popular? Placentophagy has been around for centuries in some form or another. Encapsulated placenta pills have increased in popularity in the past decade or two because more and more new parents are after the possible benefits, and pill form is much more palatable for most new parents than eating the placenta in it's raw state. Anecdotal evidence is not science based and it can be argued that there are no proven benefits, but many people are willing to try something that can help them. 3. DO we need scientific research? No. We really don't need scientific research to know that placenta pills have helped hundreds of thousands of new parents. It would be nice to have some solid evidence that it works, but nothing is 100%. There is also no real way to get solid proof that placenta consumption will work for everyone. 4. Is research even attainable? Every placenta is different, and every postpartum person is different, including their needs and goals, support and circumstances. There are experiments being done right now on the hormonal content of placenta before heating (steaming and dehydrating vs. just dehydrating). Research has also been done on the iron content of placenta, although in that study, the placebo was dried beef product which doesn't tell us much about the iron levels of someone not consuming an iron rich product. 5. I heard, or read an article that placenta pills can cause lowered milk supply, is this true? No. Across the board, most people consuming placenta pills notice an increase in milk supply and even over supply. Low supply is found in about 1.2% of people surveyed. This rumor was first started by Dr. Jack Newman and most recently be a Lactation Consultant in Northern California. In her blog post, she claims that her clients who consumed their placenta, all had low supply and blames it on the placenta. Let's explore this claim a bit. She is a lactation consultant, working in a clinic and people are going to her with issues, most with low supply. Instead of getting their permission to include them in her anecdotes, she makes claims that their low supply was due to their pills. She dismisses all the positive claims that she references. There is a great article written as a rebuttal to her article taking apart her claims. You can read it here. If you want to encapsulate be prepared to be met with negative anecdotes and opinions from friends, family members and even medical providers. Remember, this is your property and your choice. I recommend that anyone who wants to try it, just tell the medical staff at your birth that you plan to take it home. So you are pregnant. You took your childbirth prep class, your breastfeeding class and had a baby shower. You have a birth plan, a doula that you love and you even booked someone to encapsulate your placenta. Your goal is to breastfeed as long as possible, but because you have heard from so many friends and family how hard it was for them, you aren't feeling too confident. Some people do have physiological issues that cause some real breastfeeding problems. But not as many people as you would think. Only about 2% of nursing people, actually have a low supply. Some of the problems that new parents have with breastfeeding can be avoided, or at least corrected. As a lactation educator and counselor, a postpartum doula and a placenta specialist- I listen to many new breastfeeding people, and what their problems are. I hear a lot of the same common issues and hope to raise some awareness of those things here. This isn't your fault. Our medical system has taken on the responsibility of teaching you how to feed your baby, when they don't really know how. Even if you take a good lactation class, when you go to use what you learned, you suddenly have a wiggly baby who may not latch properly or may fuss at the breast. What needs to be taught prior to birth is confidence, patience and understanding. Breastfeeding is only an instinct for BABIES. We need to learn how by watching others do it. Many of us don't live near family, don't have a proper village around us and don't know anyone who has successfully breastfed. Maybe your partner wants you to breastfeed, but doesn't know how to support you. Make sure you are really clear about your breastfeeding goals with the people around you and don't let people discourage you. Trust that you can feed your baby. If you actually cannot, make sure you get help from someone with experience and education. Do you know how much time labor and delivery nurses, postpartum nurses, pediatricians and OBGyn's spend learning about breastfeeding? Maybe a day. They are not the experts. Yet we look to them right after we give birth to guide us. We put baby on a schedule from the first hour they are born. Learn everything you can in advance from a teacher that is educated. Try multiple teachers, and multiple classes. Find someone who is confident in your body's ability to nourish your baby. Humans have been feeding their baby humans forever, you can do it too! If you truly have a problem, get help! Stress is a huge contributor to low supply. When your body is stressed, you will produce less and your baby will sense your stress and may struggle with nursing as a result. Try to slow down, deep breathe with your eyes closed while you nurse or pump. ​You were really looking forward to your maternity leave. You figured 6 or maybe 12 weeks would be plenty of time to bond with baby and may even feel like a vacation. You didn't realize that you would fall in love with your baby, how hard breastfeeding would be-or how much you love it, or how long it would take to heal. Now you have to go back and you feel like you were just getting into a rhythm with baby. You find yourself needing to pump, on top of feeding your baby and putting them in the care of someone else. Unfortunately, or society doesn't really encourage new moms to stay home longer for better bonding and going back to work many times-hinders milk supply. You have heard that breastfeeding is not supposed to hurt, this is not true. In the beginning it hurts a lot. Imagine hearing that it is not supposed to hurt. Will you keep going if it does? You may think there is something wrong with you. There are many myths out there about breastfeeding that end up standing in the way of establishing a healthy breastfeeding relationship. Fear of someone telling you not to do it in front of them, or being shamed in public. Fear causes stress, which hurts supply and kills confidence. Surround yourself with those who support you and your efforts to breastfeed. Try to create a village of other parents, go to La Leche League meetings or other new parent support groups and know that this is a learning opportunity. You can do it! 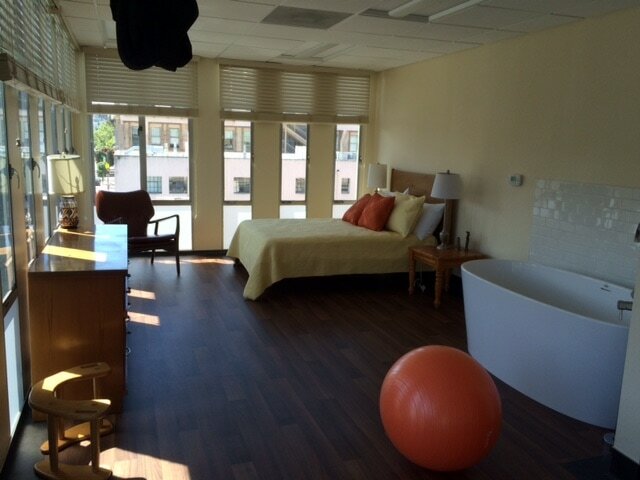 We decided to interview the San Francisco Birth Center this month. The three midwives who own and operate the birth center are Julie Birdsong, Nancy Myrick and Sara Van Acker. You can read about them more here. ​ San Francisco, CA 94115. Having multiple birth options in the city is essential to providing pregnant people with the freedom to give birth how they want. If you don't know what makes a birth center special, you may not even consider it! My own relationship with my midwives was amazing. I really believe that more people should know how intimate your experience can be with midwives in a birth center. ​If you are considering a birth there, you should go check them out! ​​Q: What​ ​do​ ​you​ ​feel​ ​are​ ​your​ ​particular​ ​strengths​ ​as​ ​a​ ​Team of Midwives? ​A: The three of us come from very different backgrounds. 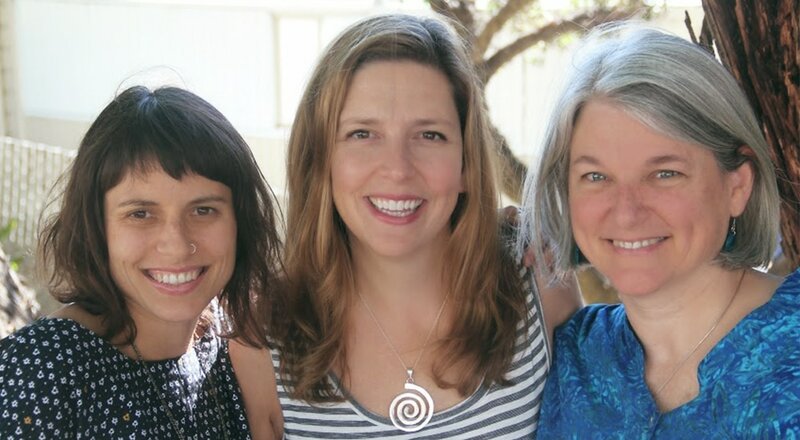 Nancy spent many years running her own home birth practice, Sara has worked exclusively in birth centers, and I come from a hospital background. Our different perspectives have really enriched our team and influenced everything from what kind of chairs and tubs to purchase to how we structure our prenatal visits. Q: What's​ ​the​ ​biggest​ ​misconception​ ​people​ ​have​ ​about​ ​what​ ​you​ ​do? A: There are so many! I often get asked, "So where do the women go to have their baby?" We're a comprehensive midwifery practice, which means we do prenatal care, birth, and postpartum home visits. Q: What's​ ​the​ ​best​ ​piece​ ​of​ ​advice​ ​you​ ​have​ ​for​ ​moms​ ​wanting​ ​an​ ​out​ ​of​ ​hospital birth? A: Eat a balanced healthy diet, exercise regularly, start a mindfulness practice, hire a doula and find a midwife that will support the birth you want to have. Q: What's​ ​the​ ​most​ ​challenging​ ​part​ ​of​ ​your​ ​job? A: I get so close with the families towards the end of pregnancy, when I'm seeing them every week. Then we go through the labor and birth together. I love the intimacy that develops, and then it's really hard to say goodbye after the last postpartum visit! I want to keep hanging out and watching their babies grow. Q: When​ ​you​ ​meet​ ​with​ ​potential​ ​clients,​ ​how​ ​do​ ​you​ ​know​ ​if​ ​they​ ​are​ ​the​ ​right​ ​fit​ ​for your practice? A: We ask a ton of questions! We go through an extensive health history just like any OB provider, but then we do even more and go even deeper. We give families a birth questionnaire to get to know them more deeply and understand their values and cultural context. Q: What​ ​other​ ​types​ ​of​ ​services​ ​do​ ​you​ ​provide​ ​besides​ ​midwifery? A: We partner with Natural Resources to offer educational classes, we host a Breastfeeding Circle on Fridays with a lactation consultant, and a New Parent's Group every Wednesday. New Parent's Group is our way of not having to say goodbye after 6 weeks. A: The Bay Area is resource rich with midwives in hospitals and home birth practices. More and more hospitals are adding midwifery services, which I'm thrilled about. In 2016, both San Francisco Birth Center and Marin Family Birth Center opened. Midwifery is growing and people are more and more aware of midwifery care as an option for their birth. We hope to pass a bill this year that will remove barriers for midwives to practice and will increase the ability of midwives to care for birthing families in less resource dense places than our own. If you love a midwife, or think midwifery care is a good thing, take a moment to help us pass AB 1612. Q: What is the benefit to having a Birth Center Birth vs a Home Birth or Hospital Birth? A: It's a welcoming, safe and intimate place. There are no alarms or extra people around. We have big beautiful rooms specifically designed for movement in labor. We are the only place you can go in SF to have a water birth. Although some of the hospitals have tubs to labor in, they prefer to have the birth happen on the bed. Home birth is very similarly intimate, however in SF so many people have living situations that don't feel ideal for home birth, whether it's a too small apartment with no bathtub or not enough space for a rental tub, concern about close neighbors, or distance from a hospital. Both home birth and hospital birth are great options, but we are thrilled to be able to offer this third option for families who want an out of hospital birth. Q: How many pregnant people do you take on per month? A: We are currently taking 12 clients per month. Next year, we plan to expand to 15-18 per month. Q: What kind of prenatal and postpartum care do moms get with you? ​A: Our first three visits are an hour long so that each midwife can get to know the family and establish a relationship. After that, we move into the group prenatal model with one on one visits as needed. We meet monthly in the second trimester and twice a month in the third trimester. During a group session, each client meets privately with the midwife, followed by a facilitated discussion on a variety of topics relevant to the stage of pregnancy. We invite guest speakers such as pediatricians, lactation consultants, and pregnancy exercise specialists to enrich the discussion. Prenatal groups offer a rich opportunity to share experiences and resources, to learn from one another, and to create a long-lasting community of support. Our postpartum care centers around family well-being and early transitions in the home environment. We want our new families to stay at home and enjoy the first few weeks. Our visits include well baby and well mother assessment as well as extensive lactation support. Home visits for postpartum care are done two to three times in the first week, followed by office visits at two weeks and 5-6 weeks. For more information or a tour, click below! Shawna is a mom of 3 and has been working with children and their parents since 1999. Just honest information to prepare you and provide you with love and support.